Turkey eggshells and bones from an offering 1,500 years ago in Oaxaca, Mexico. Credit: © Linda Nicholas, The Field Museum. The turkeys we'll be sitting down to eat on Thursday have a history that goes way back. Archaeologists have unearthed a clutch of domesticated turkey eggs used as a ritual offering 1,500 years ago in Oaxaca, Mexico—some of the earliest evidence of turkey domestication. Feinman, along with lead author Heather Lapham from the University of North Carolina at Chapel Hill, and co-author Linda Nicholas also of The Field Museum, discovered the eggs during an excavation in Oaxaca that was home to the Zapotec people going back thousands of years. "It was very exciting because it's very rare to find a whole cluster of intact eggs. This was very unexpected," says Feinman. 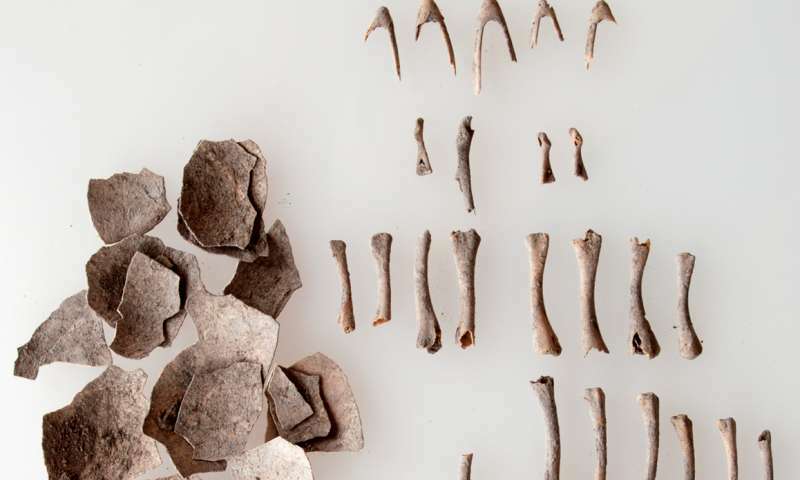 "Heather Lapham is an archaeologist who studies animal bones, and she knew immediately that we had found five intact or unhatched eggs that were left as an offering alongside seven newly hatched baby turkeys, of which only their tiny bones survived," says Feinman. Scanning electron microscope analysis of the eggshells confirmed that they were indeed laid by turkeys. 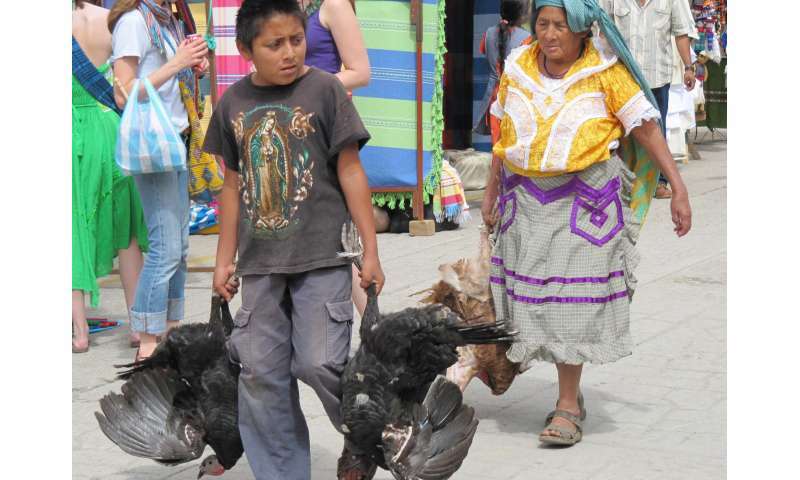 A boy with domestic turkeys in Oaxaca. near where the ancient turkey remains were discovered. Credit: © Linda Nicholas, The Field Museum. "The fact that we see a full clutch of unhatched turkey eggs, along with other juvenile and adult turkey bones nearby, tells us that these birds were domesticated," says Feinman. "It helps to confirm historical information about the use of turkeys in the area." The eggs, according to Feinman, were an offering of ritual significance to the Zapotec people. The Zapotec people still live in Oaxaca today, and domesticated turkeys remain important to them. "Turkeys are raised to eat, given as gifts, and used in rituals," says Feinman. "The turkeys are used in the preparation of food for birthdays, baptisms, weddings, and religious festivals." The new information about when turkeys were domesticated helps amplify the bigger picture of animal domestication in Mesoamerica. "There were very few domesticated animals in Oaxaca and Mesoamerica in general compared with Eurasia," explains Feinman. "Eurasia had lots of different meat sources, but in Oaxaca 1,500 years ago, the only assuredly domestic meat sources were turkeys and dogs. And while people in Oaxaca today rely largely on meat from animals brought over by the Spanish (like chicken, beef, and pork), turkeys have much greater antiquity in the region and still have great ritual as well as economic significance today." The turkeys that are so important to the Zapotec today are similar birds to the ones that play a role in the American tradition of Thanksgiving. "These are not unlike the kinds of turkeys that would have been around at the first Thanksgiving, and similar to the birds that we eat today," says Feinman.